Chennai: The SRM School of Environment Architecture and Design (SEAD), today flagged off their annual conference in Ramapuram, Chennai. Titled HASHTAG ’19 showcases the latest development in the field of Architecture. Padmashree. Ar. G. Shankar, Founder and Chairman of Habitat Technology Group inaugurated the two day national architecture conference. More than 300 architectural students from all over the nation participated. Organized for the benefit of students pursuing their studies in the field of architecture, the conference witnesses the eminent specialists sharing their best practice, research and innovations in the field of architecture. Padmashri Ar. 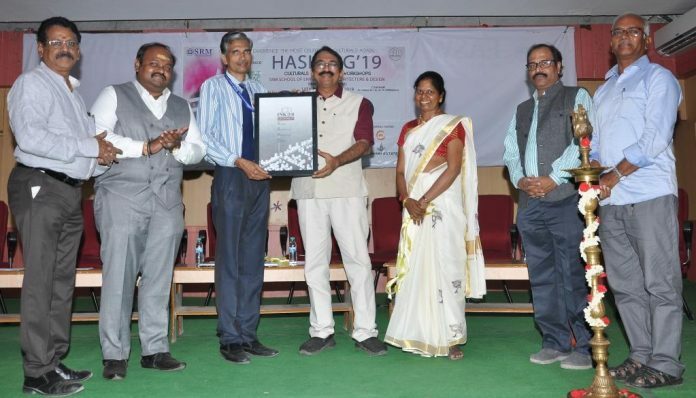 G Shankar, Founder and Chairman of Habitat Technology Group, Kerala delivered a lecture on “What do disasters teach us?” through his architectural projects in disaster struck environments. He emphasized on the urgent need for architects to able to understand and value the indigenous building construction with locally available materials. He was articulate about the responsibility of architects towards climate change and the impact of built environment on the same. During the function Dr. V. Subbiah Bharathi, Director, SRM Group of Institution, Ramapuram, Dr. Ar. N. Jothilakshmy, HOD, SEAD and Ar. Lokesh, VP Admin, SEAD were present during the function. “Divided by departments but united by Hashtag”.28 creative events. Overflowing “On the spot events” open to all students made the event a “Fun fest Gala time”.